Owning a building is a tremendous amount of work, and maintaining buildings a building can be costly. The exterior takes the brunt of the blow, thus requiring facade maintenance to ensure the safety of the public and stability of the building. This work must conform to Local Law 11/98, or the FISP program, Facade Inspection Safety Program. To maintain buildings, inspections must be done in order to assess visible damage. Inspections are a vital part of building maintenance and ensuring they are completed enables the use of equipment. Enabling inspections and construction on buildings requires permits from the DOB and DOT in order to access the facade. Construction permits for exterior work requires access to the facade. To enable this, construction equipment permits allow a closer inspection of the facade. The shed protects the public, and the scaffold allows inspectors and contractors to make a thorough inspection. In certain cases, scaffolding and sheds may not be the best way. This occurs when logistical issues present themselves to the location of the equipment. 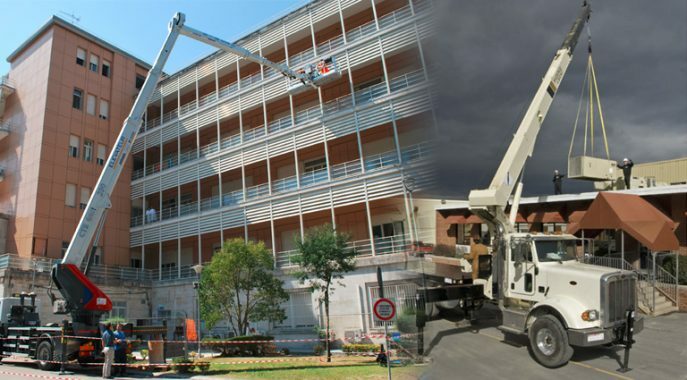 Boom trucks are a welcome alternative to construction equipment (scaffold, etc) for enabling the maintenance and inspection of a buildings exterior. Construction projects require the use of large amounts of materials. Typically on smaller buildings, the materials are stored on the ground level and brought up one piece at a time to enable construction to continue. In medium sized buildings, without a fixed crane, materials are brought up to their respective levels through the use of boom trucks. Boom trucks are versatile because they can be moved and articulate in ways a crane can’t. This helps to install windows, place materials on certain floors, or with facade installation. DOT permits are required for boom trucks regardless of their length of time used. Boom trucks require DOT permits because they occupy the roadway and/or sidewalk, disrupting traffic in the process. If permits are not acquired, the Boom Truck will be in violation, causing the contractor time and money. DOT permits, like DOB Permits, require registration at their respective agencies. DOT registration may take months, but with Direct Access our experts will help assemble and format your paperwork to get registered quicker. Once registered, obtaining the required boom truck permits is simple. There are a couple things to be wary of, mainly what type of boom truck is being used. The DOT utilizes a database to verify the boom truck manufacturer meets state, city and federal requirements. Direct Access Expediting can assess what permits are needed for projects, develop logistics plans, obtain permits and coordinate with the DOT on behalf of the contractor. We also offer applicant services in case engineer approvals are required for submissions to the DOT. Contact us today if you have questions about boom truck permits. Posted in DOB, DOT and tagged boom truck, DOB, DOT, facade, maintenance, permits. ← When is Directive 14 Filing Used?